From casual Friday to a Sunday that starts with errands and ends in a dinner date, most days aren’t about being fully dressed up or completely dressed down, but somewhere in the middle. So, here’s what you do: sample from both sides of your wardrobe. 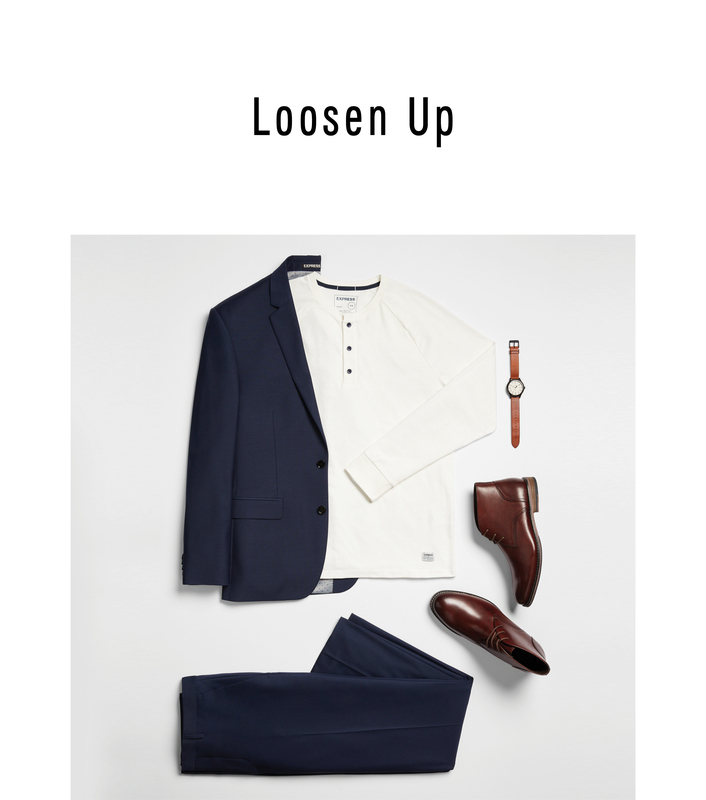 Take your favorite, slim-cut suit, the one that always makes you feel like a million bucks, and wear it with your favorite day-off gear instead of the usual shirt, tie, tie-bar trio. Formality has a place, but it shouldn’t be your only move. Here, four ways to branch out from button-downs this fall. Try one, try them all. The track suit is having a moment right now, but that doesn’t mean you have to wear it just like your favorite ‘80s hip-hop crew. 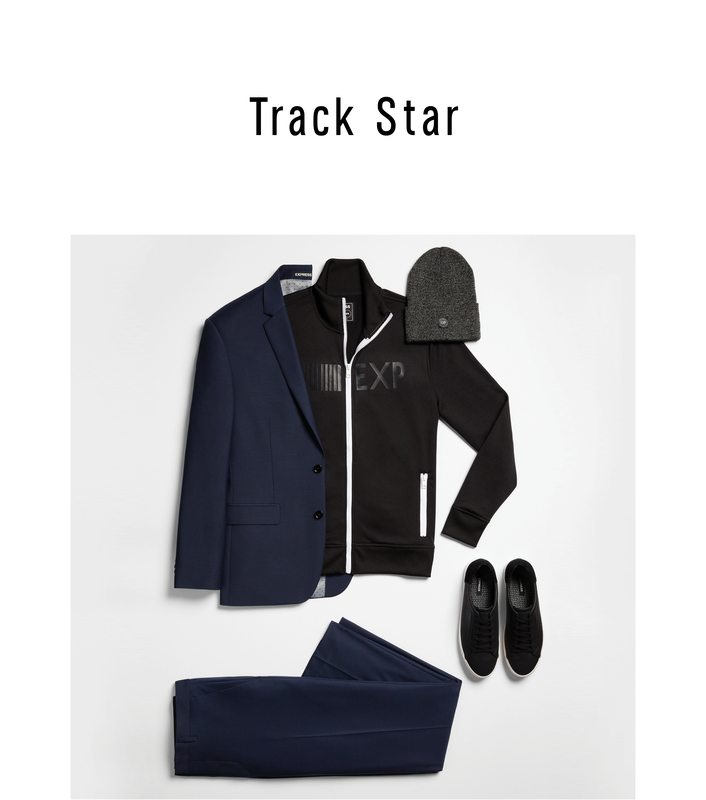 Try the track jacket under your favorite suit for a mix of sportiness and sophistication. If you work in a creative, casual office, this is definitely the move for you. Whether you’re presenting in the conference room or playing your office crush in foosball (#startuplife), you’re going to look good. Bonus points if you also walk or bike to work every morning, too. This look is much warmer and more commuter-friendly than your typical shirt and tie kit. 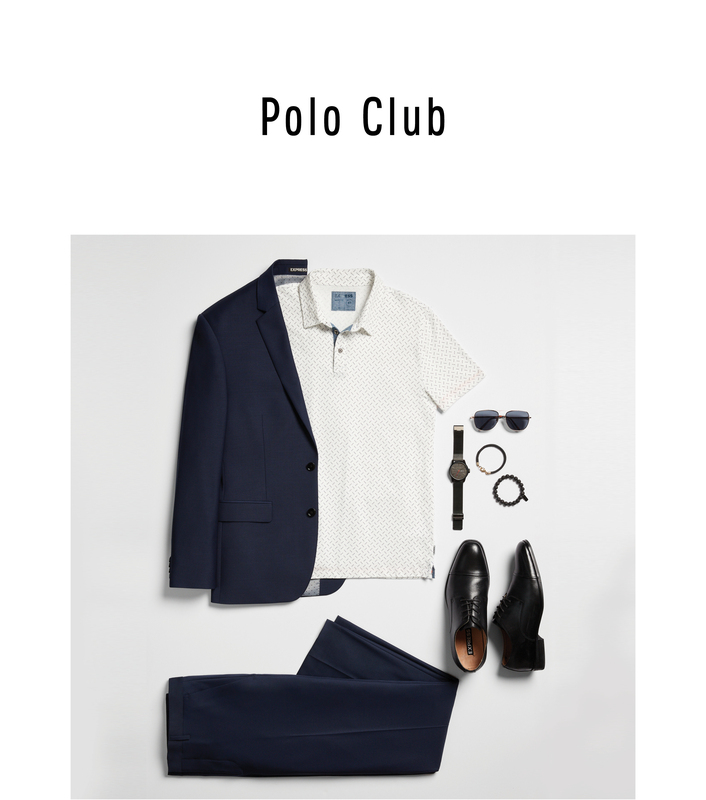 Maybe you’re interviewing candidates in your office, maybe you’re pitching your startup to an investor from a coffee shop, either way, a slim-cut polo shirt is a slick swap for a traditional button-down when you’re wearing a suit. Instead of a tie, double down on cool with a black watch or a couple of bracelets. And don’t forget the seal-the-deal-man sunglasses (think: small, square aviators) and black dress shoes (a.k.a. the universal symbol for good taste). If you’re taking this kit to watch the game, attend a city hall meeting, or run errands after work, feel free to change into polished sneakers. The sporty polo gives you plenty of flexibility with accessories. 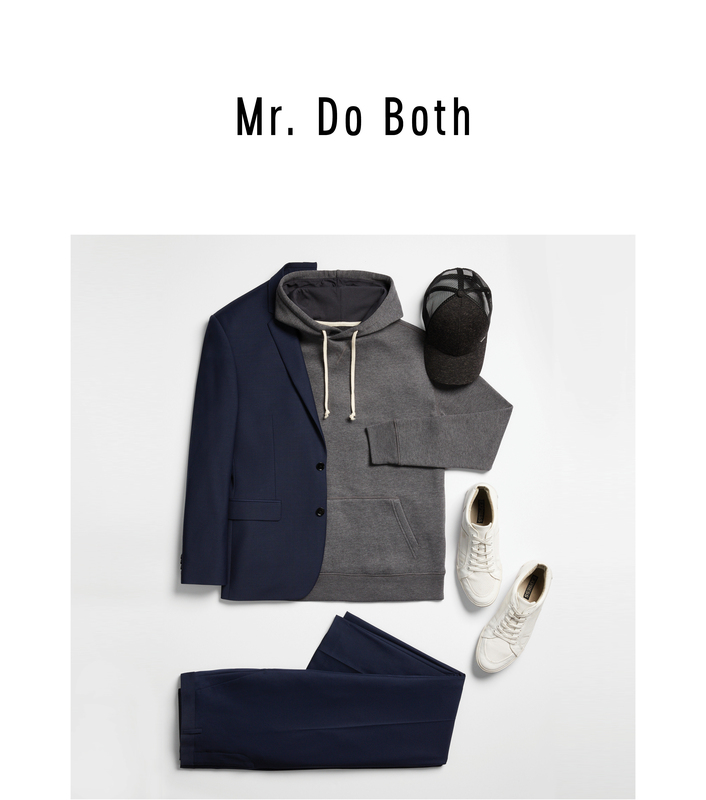 During the fall and winter months, we dig a slim, streamlined sweatshirt worn under a classic suit for a look that’ll take you from the dry cleaners at 8am to dinner at the new hotspot at 8pm. A hoodie makes the look extra sporty (not to mention warm), but a crewneck works well too if you want to keep things simple. Throw on a logo-free baseball cap and some spare leather sneakers, which bring everything together under one aesthetic roof, and you’re ready for anything. When you’re indoors, take off your hat and perhaps even your jacket while you’re at it—this look is just as solid stripped down to the basics too. We love this move for a first date, but it works whenever you want to look your most handsome (a.k.a. all the time): wear your favorite suit with a cotton Henley instead of a dress shirt, and a pair of chukka boots instead of dress shoes. The combination is a little bit ‘90s heartthrob, a little bit “guy who makes furniture”, and it’s also incredibly comfortable, which makes it a perfect outfit. Trust us on this one: the ladies are going to approve. Just make sure to tuck the Henley into your trousers for a clean look and consider adding a leather watch to make the whole thing feel a bit more put together. You can be artfully disheveled and still know what day it is.